In one campaign ad about taking her kids to the doctor, Kentucky congressional candidate Amy McGrath nevertheless prominently features her military service. That military service really fires up some voters, like Navy veteran Gregory Tucker, who was at a recent rally in Richmond, Ky., to see her. "Any person that went through the academy, the training, or you know, served in the military, are a good person," he said. McGrath, who is trying to unseat GOP Rep. Andy Barr, is one of 12 women veterans have secured nominations for the U.S. House, with still more in the Senate. Right now, there are only four women veterans in Congress. McGrath's military background helps her appeal to veteran voters like Tucker. And it could help women veterans appeal to the broader electorate, who tend to see women as less capable than men on national security and defense issues. But while service often carries an implicit message of steely toughness to voters, some women veterans are swinging in the other direction to pitch themselves to voters this year. 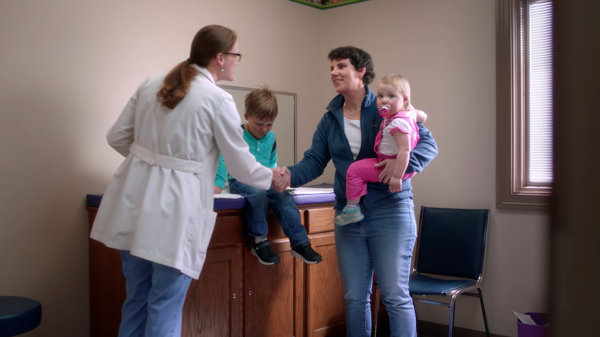 In one of her ads, McGrath loads her kids into the car to take them to the doctor. In an ad from Texas Democratic House candidate M.J. Hegar, she talks about coming back from her helicopter being shot down, while carrying a toddler. A large tattoo, which covers shrapnel scars, peeks out from her shirtsleeve. In listing off her accomplishments — serving in the Navy, getting through submerge and escape drills, working as a federal prosecutor — she also includes motherhood (as her kids hop out of the family car in front of her). "Instead of trying to fit into an outdated template of what a candidate looks like, this year, women are really running unapologetically as themselves," said Amanda Hunter at the Barbara Lee Family Foundation, noting a shift in strategy for women candidates. "So, really using their entire life experience and that includes motherhood [and] time served in combat." It's a potentially risky strategy, as voters sometimes penalize candidates who are mothers, wondering if those candidates can hold office while taking care of young children. But for her part, McGrath saw it as a smart choice to bring her own motherhood into her campaign. "Look, there might not be a whole lot of people that really can relate to being a fighter pilot. Let's just be honest," she said. "But there's a ton of people that can relate to being a mom, because I am doing it right along with them." Frances Click attended that rally in Kentucky, and she said that's how she feels. "Having veterans in my family, I know the stress and the pressures that is," she said. "But her being a mother and juggling everything is more important to me, because she understands what it's like to have to be pulled in every direction. Because she's a mother." McGrath may have her share of committed supporters, but this remains a tough race. It's rated a toss-up, and it's also a district that voted for Trump by 15 points. For his part, incumbent Republican Andy Barr is pushing back by talking about his support of veterans. "Our record of advocacy for veterans is not something that's new to us," he told NPR. "That's why the veterans of the 6th District by [a] vast majority will support me and will re-elect me over a veteran opponent, because they know that my opponent doesn't share their values." It's not just about Democrats, nor is it just that women veterans are trying to show a softer side. In the announcement ad for her Senate campaign, Arizona GOP Rep. Martha McSally used her military background as a way of casting herself as anti-establishment. "I'm a fighter pilot, and I talk like one," she says. "That's why I told Washington Republicans to grow a pair of ovaries and get the job done." This portrayal of unvarnished honesty coming from female veterans may be part of a larger trend. "I argue that candidates overall — not necessarily a gender thing — are being more real," said Missy Shorey, executive director of Maggie's List, which promotes conservative women. "And I would argue that that's something based on social media. You know, the more authentic you are on social media, the more followers you have." To her, the connection is simple; when a candidate is real — woman or man — it just endears them to more voters. "If you are just a canned candidate, where's the personality? Where's the belief? Where's the passion? Why do you care? How can you relate to people?" she said. "Showing your tattoos? I don't know. Have you been to a water park? Everybody's got one." Democratic women veterans in particular may find it easy to connect with voters this year, said Jeremy Teigen, professor of political science at Ramapo University. "I believe Democrats may be seeing female veterans as a perfect antidote to Trump and Trumpism," he said. Aside from sending the patriotic cue of military service, they are women candidates in a year when Democratic voters are particularly fired up for women candidates. "These are women who volunteered for combat duty as opposed to using medical exemptions to to avoid conscription in the 1960s as President Trump did," he added, referring to one of Trump's five Vietnam War-era deferments. At the Democrats' rally in Kentucky, Navy veteran Gregory Warner said that deferment was a factor in his vote — a stance he was proudly wearing on his t-shirt. "My shirt says, 'All gave some. Some gave all. One had bone spurs. Veterans against Trump,'" he said. Like so many other House races this year, this one isn't just about the candidates who are in it. Editor's note: NPR is examining the role of women in the 2018 midterm elections. To follow more coverage and look back at how the role of women in the 2014 midterms was covered, click here.